D. truncatus originates from Columbia. The truncatus is a mid-size frog and one of the smallest of the Tinctorius complex at around 23-30mm. The habits and care are very similar to that of D. auratus. 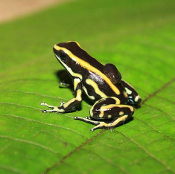 The population currently available thru Tesoros de Colombia is the 'Yellow' morph. A blue morph also exists, but is not available thru Tesoros at this time. Sexing can be difficult until the frogs are mature adults, and then the females are generally a small bit larger than their male counterparts. The D. truncatus is really quite a striking frog to see in person and and terribly under-appreciated within the US frog hobby. Frogs offered are captive bred, unsexed and approximately 7-13 months or older. Sexed pairs are frequently available.